As one of the sunniest states in the US, Arizona has enjoyed early and great success as a leader in solar energy production. 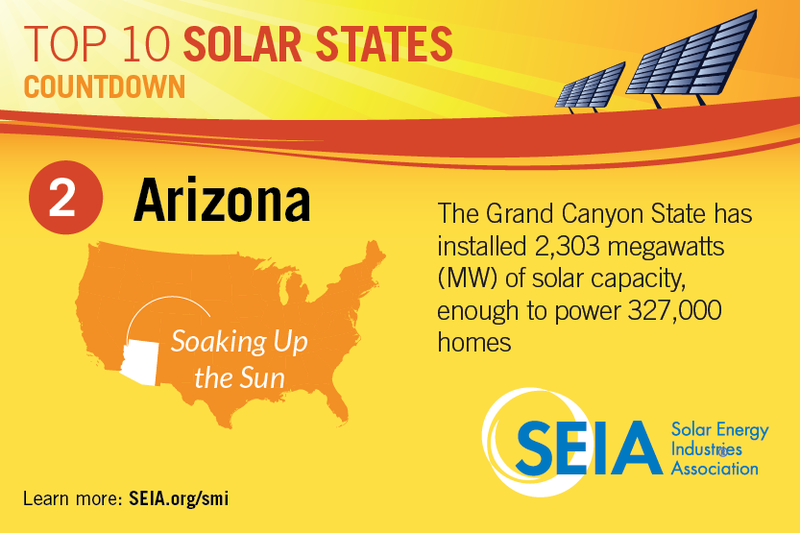 With 2,453 megawatts (MW) of solar installed, the US Solar Energy Industries Association (SEIA) ranks Arizona as #2 for total installed solar capacity. Expanding 4% over 2014, in 2015, 258 MW of solar capacity was installed, ranking Arizona 5th in the nation for 2015 installed capacity. Over $582 million was invested last year in Arizona’s solar installations. Currently, the total amount of solar power capacity installed in Arizona is enough to power 348,000 homes, but over the next 5 years, SEIA expects that number to more than double. 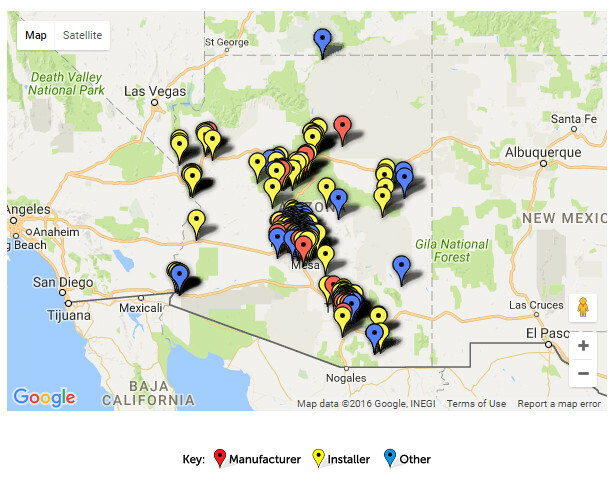 With over 375 solar companies serving the value chain in Arizona, there are more than 6,900 people employed in the state’s solar market. With all this tremendous growth in Arizona’s solar industry over the past 4 years, it is sad to see the current negative effects of solar policy manipulation and politics at play in Arizona’s energy arena. Changes in net metering incentives, the imposition of new rate plans, proposed demand rates and grid-use charges, and on top of all of this, politically nuanced media representation have given rise to huge instability in the state’s solar market. A huge back-and-forth exchange between solar proponents and state utilities has developed into a full-blown battle over the value of rooftop solar in Arizona. At the root of the tumult is the view of Arizona Public Service Electric Company (APS) and state regulators that grid-connected solar customers must pay their “fair share” for grid services in the form of an additional fee tacked on to their utility bill. Solar proponents respond that grid-connected solar energy supplies a bonus to the grid that other customers don’t offer, so paying an additional charge is an unfair penalty. Especially in the face of lowered net metering rates for excess solar energy entering the grid, proposing an additional charge for grid-connected solar customers has really slapped rooftop solar customers in the face and heated up the public debate. The volley reached the level of drafting competing solar ballot initiatives to amend the state’s constitution, until solar advocates and state lawmakers entered mediation, brokered a compromise, and dropped the ballot initiatives. The ceasefire, brokered between SolarCity (representing “Yes on AZ Solar,” a political action committee funded by SolarCity) and Arizona Public Service Company finally occurred when the two sides agreed to mediate over how solar customers will be compensated for their excess electricity. The ceasefire was brokered less than 1 hour after the Arizona State Senate initiated steps to send the electorate measures mandating separate rates for rooftop solar customers, and for regulating solar leasing companies as utilities. However, the squabbles over Arizona’s solar energy future are not over yet. A year-long Value of Solar Docket was opened at this same time last year, hoping to resolve the rancorous debate over solar customer compensation once and for all. The VOS docket could conclude within the next month and promises to offer another round of spectacular fireworks, rhetoric, and politically nuanced media representation. Stay Tuned! The following is an (untumultuous) in-depth exploration of the state of solar energy in Arizona. Please feel free to offer further contributions in the comments, below. 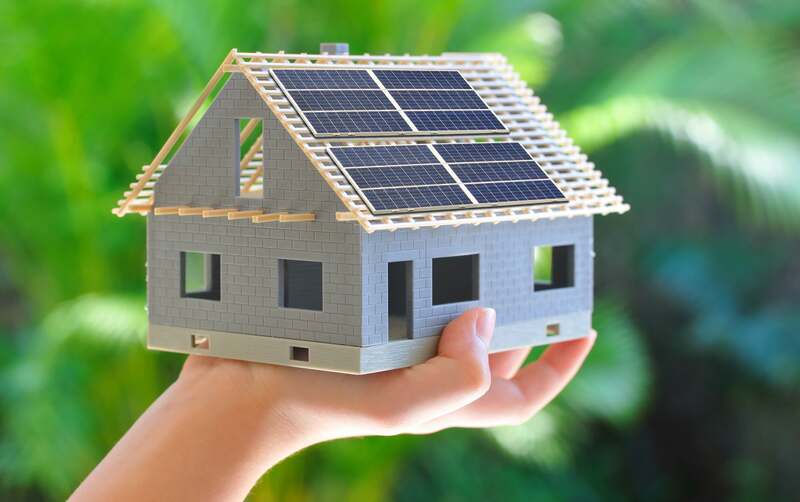 Because everyone’s situation is unique, there’s really no substitute to simply getting a solar quote. However, research and data are always being updated and the SEIA reports that installed solar PV system prices in the US have dropped by 12% from last year and 66% from 2010. The latest data indicates that in 2016 the average installed cost of solar in the US is just below $3.50/watt for residential and $2.00/watt for commercial installations. This means that today it will cost about $17,500 to buy an average-size (5 kW) system at roughly $3.50/watt. In Arizona, 6 kW systems are fairly common, so this price works out to about $21,000. Even using 2011’s data for monthly savings, at $137 saved per month for Arizona over the course of 20 years, this works out to be $32,880, netting a gain of (at least) $11,880 on a 6 kW system installed in 2016. What if you don’t stay in your home for the full 20 years? In Arizona, property taxes don’t increase with the addition of a rooftop solar installation, but your home’s sales value increases an average of $5,911 per kilowatt of solar installed, according to a 2013 Lawrence Berkeley National Laboratory (LBNL) study. So, even if you sell your home in the year following your 6 kW solar rooftop installation, it is reasonable to expect a sales price increase of something like $35,466. This leaves you with a net gain of about $14,466 on your ($21,000) solar rooftop, assuming you sell your house at the asking price. Sell or stay, either way, rooftop solar is a win-win scenario! The federal solar investment tax credit (ITC) is available in all states of the US. Up to 30% of a solar installation’s costs can be credited via the ITC. However, you can only take advantage of the credit once, and only if you have that much tax liability in that tax year. Currently, the 30% ITC extends through 2019 but is scheduled to be phased out after that. Businesses may also qualify for incentives, including the Renewable Energy Production Tax Credit (PTC), the Business Energy Investment Tax Credit (ITC-1603), and a corporate depreciation incentive, as well. The following are a few of Arizona’s state solar energy incentives listed on the DSIRE Incentives Database. Operated by the N.C. Clean Energy Technology Center at N.C. State University, the Database of State Incentives for Renewables & Efficiency (DSIRE) offers an up-to-date and comprehensive website for solar energy incentives across the US, including federal and state incentives, programs, and policies. Additional Charges: The ACC requires net metering charges be assessed non-discriminatorily. Any new or additional charges increasing eligible customer-generator’s costs beyond that of other customers in the rate class that the eligible customer-generator would be otherwise assigned to must first be proposed to the ACC for consideration and approval. The ACC also notes that the utility has the burden of proof in any such cost increase proposal. In December 2013, responding to an application from APS addressing cost shifting, the ACC ordered a $0.70 per kW charge (a $3.50 monthly charge for a 5 kW system) for all residential distributed generation systems installed on or after January 1, 2014. ** However, this charge doesn’t apply to customers with systems installed on or before December 31, 2013. The ACC also requires APS to file quarterly reports about the number of new distributed generation installations per month, the kW size of those installations, and to report the amount of revenue collected from customers through the lost fixed cost recovery charge. Other utilities have also proposed additional charges for customer-generators. *Salt River Project (SRP) and municipal utilities do not fall under the jurisdiction of the Arizona Corporation Commission, and are therefore not subject to the state net metering rules–see SRP Net Metering Program Overview, below. **The charge applies specifically to “distributed generation” systems, not “net-metered systems.” However, as net metering only applies to systems located on the customer’s premises, this charge will affect net metering customers. The charge only applies to APS customers. • Net Excess Generation: Credited to customer’s next bill at retail rate; held for same time of use period. Note: Salt River Project (SRP) requires an interconnection agreement. SRP changed its existing net metering program for residential customers in February 2015. These changes went into effect with the April 2015 billing cycle. However, customers who purchased their distributed energy system or signed a lease agreement before December 8, 2014, are allowed to keep their original net metering rate plan for 20 years. Additional Charges: Under SRP’s self-generation plan, customers must pay a fixed monthly service fee based on the size of their electricity service. They also must pay a grid, or demand, charge based on the customer’s maximum energy usage during peak electricity times. According to SRP, the energy charges per kilowatt-hour (kWh) are lower with the customer generation plan than with the standard residential rate plans. Aimed at reducing Arizona’s staggering peak load, a $4 million residential storage program was mandated in July 2016 by the Arizona Corporation Commission (ACC). Arizona Public Service (APS) received a 120-day deadline to firm up the specifics and get approval from the ACC, making this the first time a state besides California has mandated investment in home energy storage. Totally amazingly, the ACC has initiated this hallmark policy at no additional cost to ratepayers by tapping into an existing fund for energy-efficiency projects. Commissioner Andy Tobin proposed the idea last June. Refined with the help of Commissioner Bob Stump, the proposal passed at ACC’s July meeting. The ACC’s proposed residential energy storage program offers a new option. Incentivizing residents to use stored energy at peak load times may be the best solution for Arizona. The pilot plan may even lead to a robust market for energy storage in the state, as well as offering significant savings for residential ratepayers. • Agua Caliente in Yuma County was completed in 2013 by developer First Solar. This photovoltaic project has the capacity to generate 290 MW of electricity– enough to power over 41,200 Arizona homes. • At 125 MW, Arlington Valley Solar Project II is among the largest solar installations in Arizona. Completed in 2015 by LS Power, this photovoltaic project has enough electric capacity to power more than 17,700 homes. • Several large retailers in Arizona have gone solar, including Wal-Mart, REI, Intel, and IKEA. Macy’s has installed one of the largest corporate photovoltaic systems in the state with 3,456 kW of solar capacity at their location in Goodyear. Solar Electric Systems & Products, Inc. It is worse than ironic that Arizona should be debating the value of rooftop solar energy generation. The Arizona Public Service (APS) has around $2 billion invested in solar energy capacity, with a portfolio divided between 551 MW of rooftop solar installations and 499 MW of utility-scale solar plants. This past summer, amidst all the tumult and rancor over rooftop solar customer compensation, APS became the first utility outside of California to surpass 1 GW of solar energy capacity. Reaching this milestone hasn’t exactly promoted solar benevolence among APS, however. As noted in the introduction, APS has rather promoted battle between itself and Arizona’s solar advocates, narrowly avoiding a ballot initiative to amend the state constitution in favor of rooftop solar customers. A rate increase proposal before the Arizona Corporation Commission (ACC) is currently under review, pushing for a mandatory demand charge that would increase residential customers’ bills by an average of 7.96%. In November, the ACC is expected to vote on a methodology for quantifying the benefits of rooftop solar for utility ratepayers. The “Value of Solar” docket, as the ACC vote is referred to, is a critical pivot point upon which Arizona’s rooftop solar industry is poised, breathless but hopeful for its future. “The Arizona Corporation Commission is holding a proceeding to determine the value of rooftop solar, the value that utilities should pay customers who deliver electricity back to the grid. It is clear that rooftop solar benefits all Arizonans. It drives down costs for utilities by lessening the need to build new generating stations and transmission lines, for starters – costs that are passed onto us. “Solar gives Arizonans options to generate their own electricity and lower their bills. It reduces pollution. Solar saves water. Solar creates jobs and provides almost 9,000 Arizona families with incomes higher than the national average according to the Solar Foundation. The benefits of our sunshine and rooftop solar are numerous. “Rooftop solar encourages free market competition. That’s why Arizona monopoly utilities have been trying to undermine rooftop solar. They don’t want you to supply any of your own energy. “The outcome of the ACC Value of Solar docket will impact all Arizonans. Recent independent studies conducted in other states show rooftop solar provides a long-term benefit to all, whether you have solar on your roof or not. “If our Arizona Commissioners conclude that solar is not a net positive for everyone, utilities across our state will use this as an excuse to strengthen their monopolies. This will hurt Arizona energy choice and send jobs and business running from the state. All benefits need to be thoroughly considered in the Commission’s deliberations. “Currently six utilities regulated by the ACC have filed proposals that threaten to eliminate thousands of solar jobs and the growing solar industry. Now, they are hoping that the value of solar proceeding will give them an excuse to do so. “A fair methodology for assessing all the benefits of rooftop solar would do the opposite and stop the utility assault on rooftop solar in its tracks. Goldwater and Sheahan urge interested people to call the Arizona Corporation Commission and reference the Value of Solar Docket. ACC Phoenix Office: (602) 542-4251 or 1-(800) 222-7000 (Toll Free In-State Only). ACC Tucson Office: (520) 628-6550 or 1-(800) 535-0148 (Toll Free In-State Only).